With finances playing such a huge role in whether or not a parent will be there for their child's first moments, how can a bank help? Introducing Ally+1: a financial savings tool for future parents. The Ally+1 program in 60 seconds. *All stats from a 2012 U.S. Department of Labor FMLA study. More information on the study's findings and the cost of parental leave can be found here. The Ally+1 program starts with a free online tool that allows future parents to calculate how much they'll need to save for their leave, based on things like their income, monthly expenses, and the amount of time they'll want to take off. Once they've set up their Ally+1 savings account, they’d also be offered an Ally+1 credit card. The card would provide 1% to 5% cash back rewards at select child-related retailers. The card comes designed either for couples or single users. After they've signed up for their savings account and credit card, members can check in on their progress and rewards through the Ally app. Once they're Ally+1 members, expecting parents will also receive a few extras to help them as they go. Ally knows that saving can be a long process, so they'll send future parents encouraging greeting cards at key milestones in their savings journey: when they first sign up, when they're halfway through, and when they're finally done. 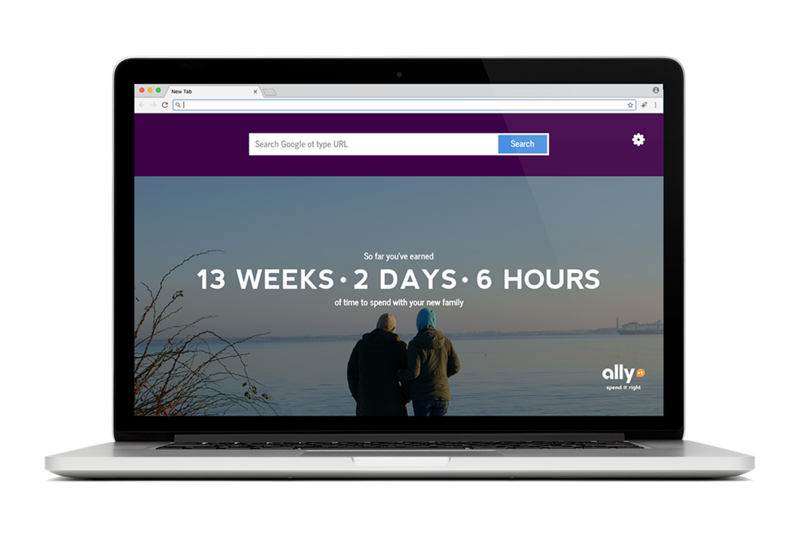 Members can also download and install an Ally+1 Chrome extension that will translate the money they're saving into the amount of time off they've already saved up. People can also download the extension if they're not an Ally+1 member but still want to use the baby countdown clock. Expecting parents will also get a sticker for their car, to be peeled off once the baby arrives. So how do we get people interested in the new program? With Ally+1, the sacrifices you make now to save will be worth it when you get to make sacrifices later for your child. Ally will talk to future parents first on Pinterest, where people often go to find DIY, homemaking, and saving ideas. In addition to finances, another huge worry with parental leave is missing out at the office. Ally will partner with Slack so that coworkers back at the office can send encouraging messages to parents on their leave—and let them know they're not missing out on anything. All How can a bank help with parental leave? How can a shampoo celebrate girls for what's in their heads, not on them? How can a review site better support local business? How can an intern get some work produced? How can a young copywriter show you more projects? How can a bank help with parental leave? How can a shampoo celebrate girls for what's in their heads, not on them? How can a review site better support local business? How can an intern get some work produced? How can a young copywriter show you more projects?